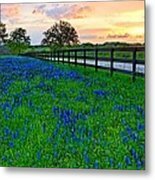 Queen duvet cover (88" x 88") featuring the image "Bluebonnet Fields Forever Brenham Texas" by Silvio Ligutti. Our soft microfiber duvet covers are hand sewn and include a hidden zipper for easy washing and assembly. Your selected image is printed on the top surface with a soft white surface underneath. All duvet covers are machine washable with cold water and a mild detergent. 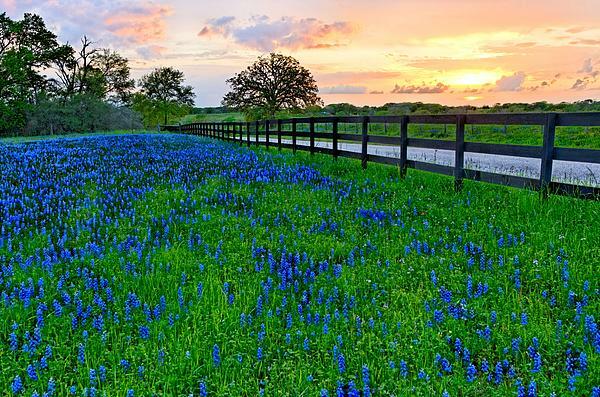 Love the blue flowers with the yellow/orange sunset! Lovely capture - congratulations on your sale. Hi Silvio :) Congrats on your sale! Beautiful artwork! Congratulation on sale announcement and fantastic. Congratulations on a wonderful sale, Silvio!! This is beautiful!!! Awesome perspective and composition! Congrats! Nice work !!! And Congrats on your sale! 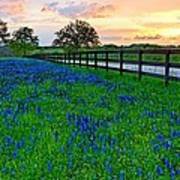 An abrupt turn of the country road I was driving on near Brenham, Texas, revealed this bluebonnet field way off the beaten path. To be honest with you I was standing on private property while I made this photograph. It was the only way to capture this stunning vista with the sunset as background!